On the 14th and 15th of December 2016 the third FLOOD-serv workshop took place in Bratislava in the office of the Bratislava Self Governing Region. 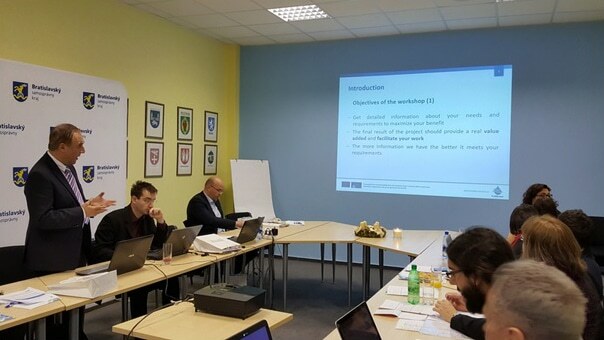 The main objective of the workshop was to briefly outline the user requirements of the Bratislava pilot. Members of the Flood-serv consortium (ANSWARE, ANO, Cellent, Exdwarf) and the representatives and stakeholders in Bratislava engaged in a lively discussion that enabled the preselection of the FLOOD-serv components for the use case in Bratislava. On the second day a press conference was completed. Exdwarf, the technical partner of BSK presented and explained the benefits that the use of the tool would offer to the region.